Anyway: this card comes from the design of those bags. I can't say it came out just like I pictured, but it is what it is. :) I hope you enjoy! So I fell in love with these boxes when I made them for one of our club projects this month. (See THIS POST to know what I'm talking about.) So of course I had to make some with the FABULOUS new Designer Series Paper I got. This one is Georgia Peach. I LOVE LOVE LOVE LOVE it! (Did I mention that I LOVE it?! :) ) I also use the set we got at convention for FREE from UPS! :) That was a fun surprise and bonus that we got for attending. However, given that it was the 20th anniversary celebration, I kinda figured/hoped they would give us a little something extra as a surprise. 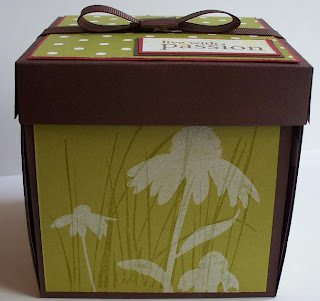 :) Anyway: I put some bath salts in a little baggie in this box. I LOVE these! They are fun to make and I suggest you give one a try! Enjoy! Can you believe this Designer Series Paper?! 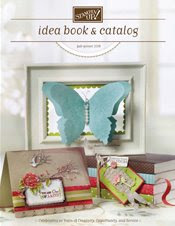 Oh my goodness...I LOVE LOVE LOVE LOVE ALL the Designer Series Paper in the new catalog. Seriously...LOVE it. I had the hardest time deciding what papers to get RIGHT NOW...because I know I have to have them all eventually. :) Anyway: here are some SUPER quick 3 x 3 cards that I made using some of the new paper, Hawaiian Papaya. I love that name. :) Anyway: these are so easy. 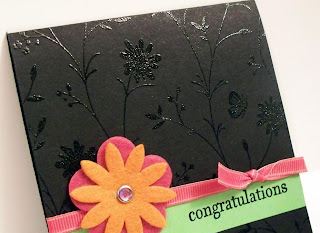 I just cut the DSP to 2 3/4" x 2 3/4" and stamped the greeting on there. 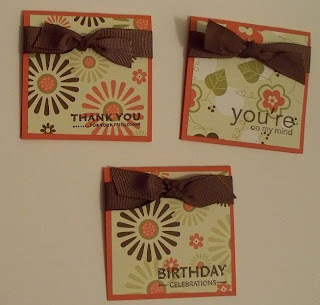 (The greetings are from the "Upsy Daisy" stamp set that is ON SALE until Sept. 30th! LOVE this set!!!) 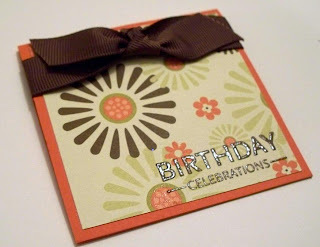 I actually stamped the greeting in Chocolate Chip CRAFT ink so I could emboss using Crystal Clear emboss powder. So I embossed it, then mounted it on Tangerine Tangy card stock. 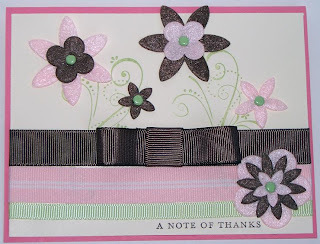 I then tied Chocolate Chip 5/8" grosgrain ribbon around the card. And VOILA! Finished! So quick and easy and I actually really love it. I wanted to make something that showcased the paper. I think it works. (Note: I'll be selling these at the Farmer's Market this Saturday so if you are the area and want to come and see them in person...come on over! :) ) Hope you enjoyed them, get some inspiration from them, like them, etc! (Sorry for the bad pictures...took them at night!) Here is one more pic...I wanted to give you an up close picture of one so you could see the embossing. It's time for another class! 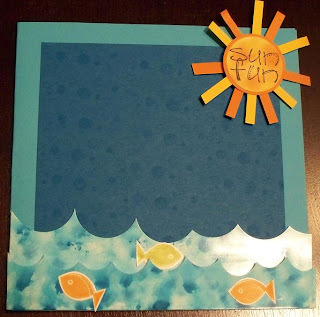 :) The next class being held is an Explosion Box Scrapbook using a FABULOUS NEW stamp set from the new catalog as well as FABULOUS new Designer Series Paper. This class is being offered two different times. If you are nearby any of these locations and would like to come, just let me know!! Would love to have you come! RSVP by Friday August 22nd to ensure your spot! All supplies for the amazing projects, Snacks, Door Prizes, Great Special Deals for Attendees Only. Please let me know if you have any further questions! Look forward to seeing you at one of these classes!! This is a project we did at convention. Some of you have probably seen it...and made it! It's a great scrapbook page. I love it. I am going to turn it into a 12x12 page and add photos of my darling daughter. :) Love this. 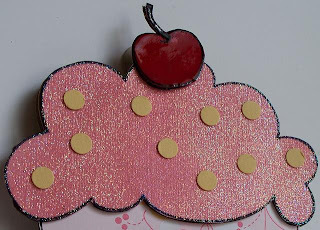 This is one of the cards at the shoebox swap that we made. (Well...those that were in my group. :) We were divided into 3 groups because there were SIXTY people at this event! It was great!) This card actually won first place in our group of cards we were making. There are little micro beads on the elephants ear...how cute is this?! 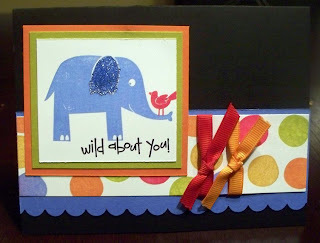 I love this card, color combo, everything! Hey there club gals! I hope you are all ready for this month's club! :) It's tomorrow! 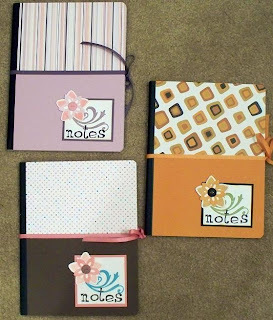 :) Wanted to share with you and all of blog world what we are making! Hope you enjoy! This first card was inspired by one I saw on THIS BLOG. 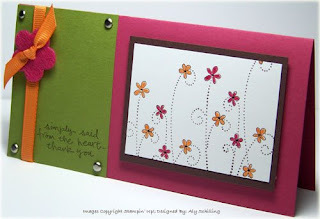 I just LOVED the colors and what she did with the FABULOUS new stamp set, Eastern Blooms. (This is actually on sale this month...15% off!!!) I loved the card, so of course I had to use it as inspiration to make my own. 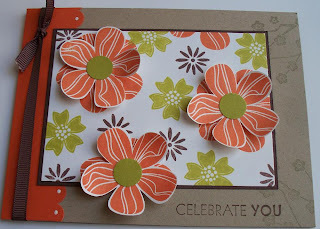 The three bigger flowers I stamped and cut out, and then put over the ones I stamped in the background with dimensionals. I liked the dimension that gave the card. I know...more stuff from convention. What can I say? It was DAYS of inspiration for me! I really loved every second. It was awesome. 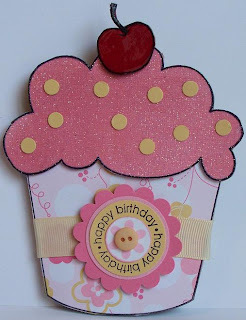 Anyway: this card is SO CUTE! It's using the new In Colors and just SO FABULOUS! I love it! It was done by an AMAZING stamper in my group, Mandy. (Have a blog or anything, Mandy?! If not...GET ONE if you're reading this!!! 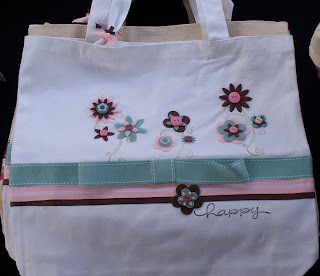 :) ) This was a wow project that we did at a shoebox swap my upline held. I LOVE this card. It's one of the pop-up cards like I did before in THIS POST. Anyway: enjoy! 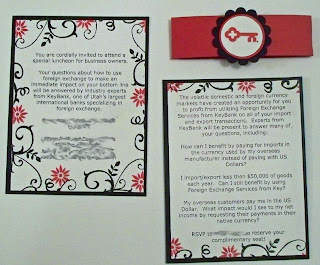 Here's another view of the card...so you can kinda see how it's done. Plus...see the alligator and lion peeking out from around the main card? 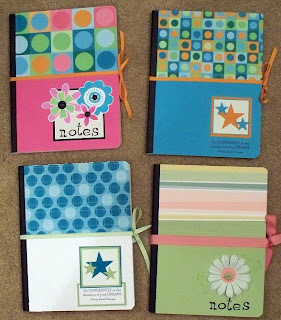 Great idea and so cute. This set is awesome!! (It's Wild About You, by the way.) It's using the new In Colors. It's going to be another great year with these In Colors! I love them! Ok...so I've kinda fallen behind with what I had already planned on sharing with you about convention. 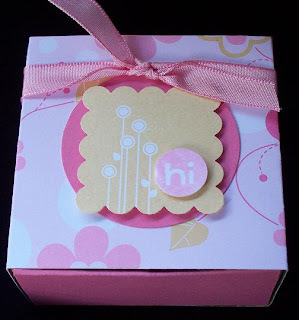 :) But I definitely wanted to show you this...HOW CUTE is this BOX?!?! 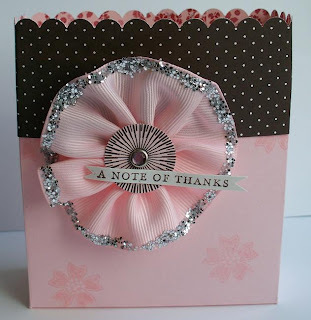 That ribbon is made with the NEW 1 1/4" Pink Pirouette grosgrain ribbon! AHHHH! We can start ordering at NOON tomorrow! So yes...that is what I will be doing at this time tomorrow. Ordering my FIRST STUFF from the NEW CATTY! I can't wait. :) Anyway: to make this rosette, you simply make stitches every 1/4" or so down one edge of the ribbon (we used the Linen Thread but I am sure you could use whatever thread). Then when you have gone the whole way, you just pull one end which gathers it all together. It is SO CUTE and my new fave trick with ribbon. :) Give it a try! Then to get that glittery edge...just put a line of Crystal Effects around and then pour chunky glitter on it. SO CUTE! :) Anyway: had to make sure I shared this with you! Enjoy! I forgot I haven't posted this yet. This was one of the swaps I did for convention. Just wanted to share this! 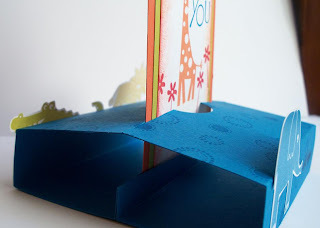 Do you love having card stock pre-cut for you? Then this is for you! 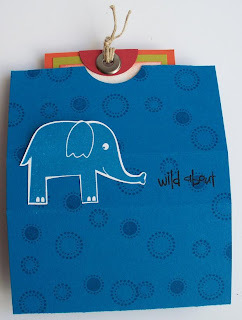 It's time for a NEW Stampin' Up! 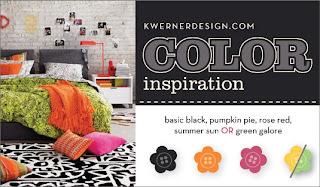 Catalog, and a NEW service I'm offering YOU! I'm going to be offering a "Card Kit of the Month" each and every month. 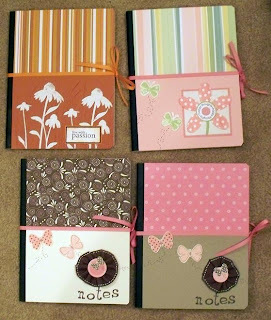 It will give you the opportunity to have easy cards to make each month and to try new colors/accessories/etc. 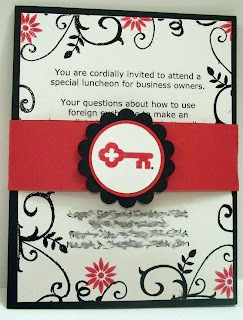 I will be featuring both a Stamp Set of the Month as well as an Accessory of the Month. This month's card kit items are listed below, and the price of the Card Kit is $15. This kit includes all of the consumable supplies you will need to create 12 cards, with the exception of the Flower Fusions Accents. 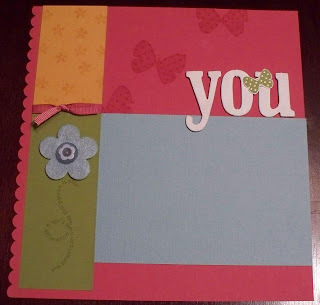 Shown above is just 1 example of a card you can make with your kit. Purchase the kit, and receive 3 additional full color samples for "alternative" cards you can make with the contents of your kit! In addition, you'll receive detailed, step by step instructions on how to complete each of the 4 card designs. 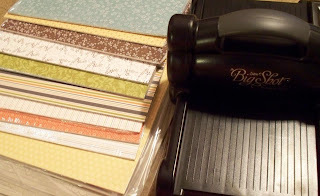 Already have the ink pads and stamp set needed to make the cards in this kit? Just buy the Card Kit! Don't have some (or any) of these items? See the "Add-on Products" list to pick out and order what you need to complete the cards. 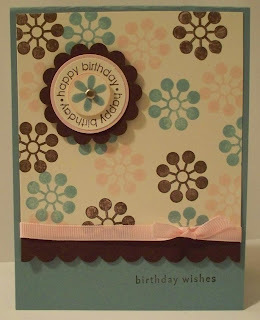 Just want the Card Kit to make your own designs? Go for it! Orders for the Card Kits must be received by August 15th. You will receive your kits by the end of the month. Special Offer for August! 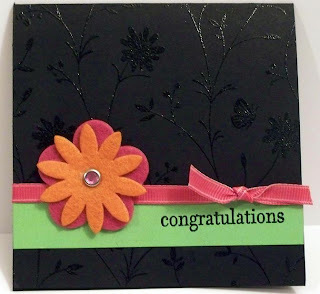 Purchase the Card Kit and receive the Coordinating Set, "Simply Said" and the Coordinating Accessory, "Flower Fusion Accents & Elements" at 20% off! Please Note: If you live far away from me you can still participate! I am glad to ship kits directly to you! If the kit needs to be shipped, there will be an extra $3 shipping charge. Feel free to invite any friend(s) that you think might be interested. All are invited to participate!!! Contact me today to order your Card Kit and see how quick and easy card making can be right in the comforts of your home! Anyway: let me know if you have any questions and ENJOY! So this is an invite I made for an event for my husband's work. It is two cards with info...held together with a belly band. It actually was pretty fun to make...and I think turned out pretty cute. Brian (my husband) is pitching it for me to his fellow co-workers to get everyone on board. I will be sharing more convention projects soon...but don't want to stay up too late because I'm still catching up on some missed sleep. 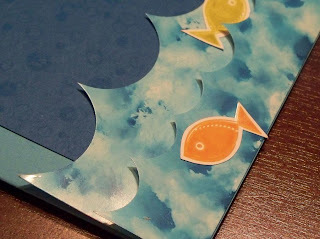 : ) I do want to show you two of the Make and Take's we did with our NEW STAMPS!!!! We got 3 new stamp sets in our convention bag and then at the end they gave us ONE MORE free one that was donated to all of us by UPS. SO FABULOUS!!!! This card is so cute. 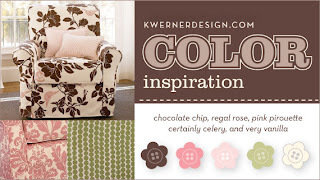 If you look at the bottom...we used the new scallop edge punch!!! SO MUCH FUN and I think I'll be using that ALL the time now. Well...I already have been. 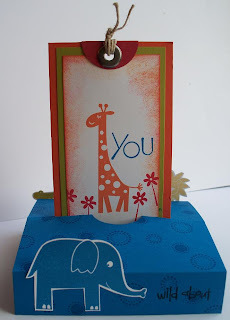 :) But the "u" is chipboard and I think adds such a great touch. This is a close up of the bow. My new fave bow now. :) It's so easy to make. 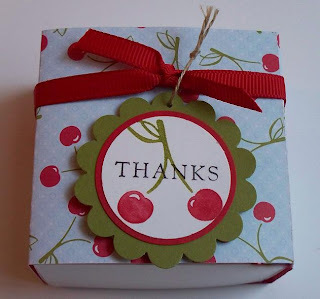 Wrap some ribbon around your project. Take another piece of ribbon and adhere the ends together to make a loop. 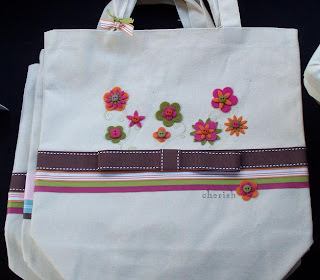 Then cut a small piece of ribbon, wrap it around the loop in the middle to bring it together and create this. Then just adhere the bow to the ribbon piece you've already wrapped around your project. So easy and SO CUTE!!!! Anyway: I didn't know what I had won yet...whether it was Rising Star or Demo of the Year. They have a big Awards Night that you had to go to find out what you won. Well....I was positive it was for Rising Star and I was positive I was #15...that I just slid right in. :) Brian came with me to Awards night (sorry...my husband for those that don't know) and we got to sit in these special "Founder's Circle" seats and everything. We were so close we could see the TelePrompter. So we knew who was being called before they announced it. When they started with the Rising Stars...I knew I was going to be #15. Well....they called that and it wasn't me. Brian got excited...I got nervous thinking they really were making a mistake and I wouldn't ever be called. Then #14 called and Brian was more excited, me more freaked out. #13, #12, #11 called. Same thing. Well....#10 was called and IT WAS ME!!!!! I was SO SO SO excited!!!! 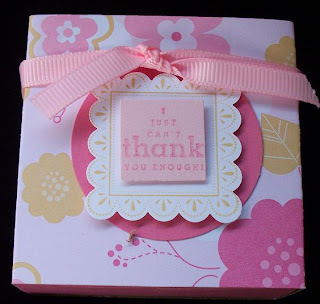 THANK YOU STAMPIN' UP!!!!!! (This is what happens when I leave my husband in charge of the photos! This is me hugging Shelli and meeting Shelli FOR THE FIRST TIME!!!! She said in my ear, "Yeah!!! A Utah girl!!!" :) So in September I get an all expense paid trip to a spa in St. George!!!!!!! I CAN NOT WAIT!!!!!! Here are some shots from convention. I can't believe it's over. I'm SO SAD!!! It's fun to get back to my family, but it is SUCH a good time that it's sad to say goodbye for a year. Thanks to everyone for making it SO FABULOUS!!!! And here is my group. This was at the end. So sad to be all done. It was so much fun and hope we're all able to make it next year!!!! Thanks for the blast of a time girls!